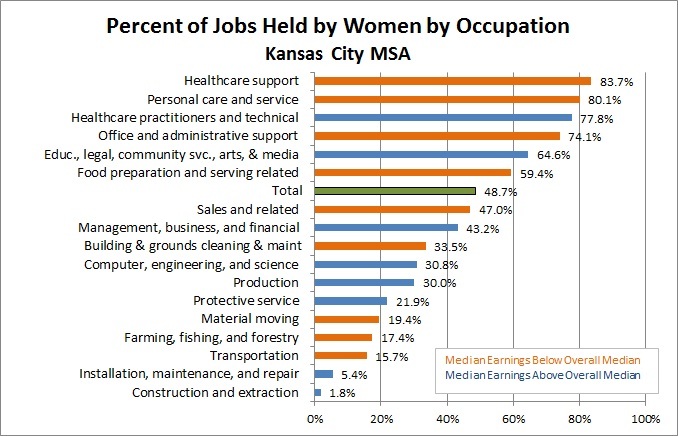 In a blog post last fall, we looked at the occupations that were most likely to be held by women versus those commonly held by men. It is not terribly surprising that some occupations tend to be dominated more one gender or the other, but what about race? Are some jobs more likely to be held by white workers versus non-white? The Census Bureau provides data for this type of analysis. First, let’s take a look at occupations by gender. You can see that some of the jobs traditionally held by women still are dominated by women. Women account for 84 percent of health care support jobs (such as home health aide or physical therapist), 80 percent of personal care and service jobs, 78 percent of health care practitioner jobs (predominantly nurses) and 74 percent of office and administrative support jobs. On the other end of the spectrum, women hold fewer than 20 percent of the jobs in construction, installation and maintenance, transportation, farming, and material moving. 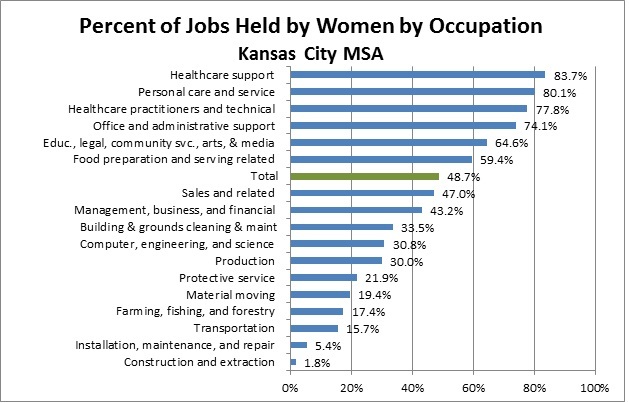 Overall, women hold 48.7 percent of all jobs in the Kansas City metro. 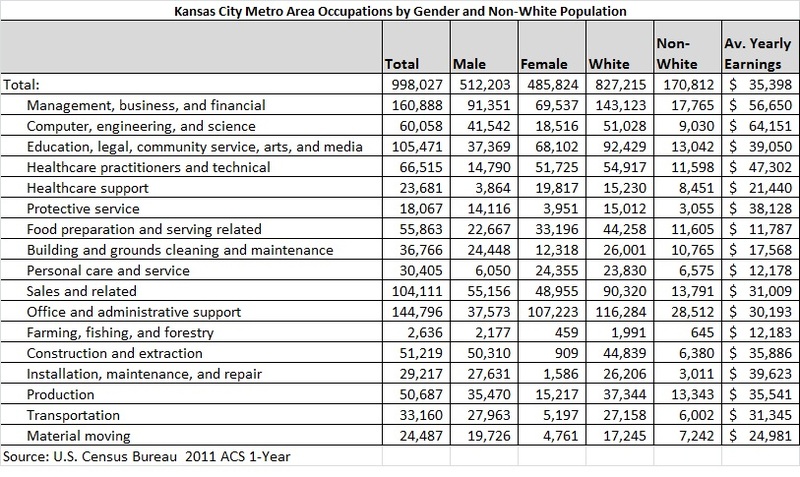 The non-white population accounts for 17 percent of the region’s total jobs, but in some industries, the percent is much higher. Non-white workers make up more than 25 percent of the jobs in health care support, material moving, building cleaning and maintenance, and production. 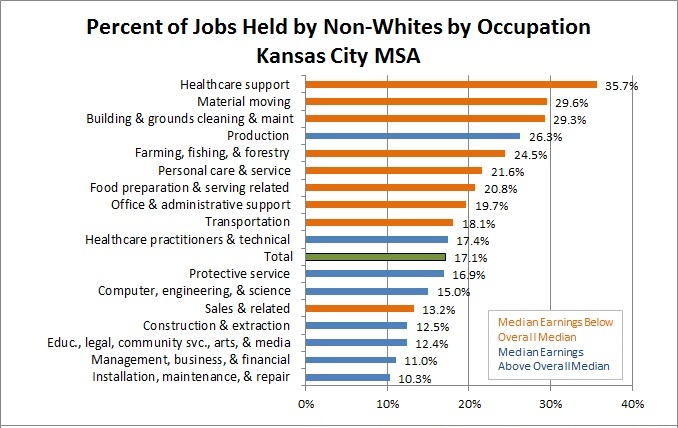 Non-whites are not as well represented in installation occupations, management, business and financial positions, or education/legal/community service jobs. These imbalances become more of a concern when you add earnings to the mix. The following charts are identical to the charts above, but they are color coded to show which occupations have median wages below the overall median (in orange) or above the overall median (in blue). For women, high- and low-paying occupations are spread throughout their occupational distribution. However, it is still the case that women tend to be overrepresented in at the lower end of the wage scale, as four of the six occupations where women hold the majority of the jobs have median earnings below the overall median of $35,398 a year. This is even more true for non-whites. For non-white workers, eight of the 10 occupations that are disproportionately held by minorities have median earnings below the overall median. Production (or manufacturing) is the only occupation group above the overall median in earnings where non-whites hold a significant proportion of jobs. Clearly, these imbalances are a problem. Certain occupations have a history of being dominated by one gender or another. These traditions clearly persist in occupations like nursing and teaching. But what is driving the differences in occupation by race? We would suggest that when comparing white vs. non-white occupations, tradition is less a factor than education. The ongoing, well-documented differences in educational attainment between white and non-white populations have carried over into the job market. People who have little, if any, post-secondary education are more likely to hold jobs with lower wages. We will take a look at educational attainment by gender and race later. Below is the raw data driving the charts.